[Updated for 2012-2013 forecast] The US dollar continues to strengthen relative to the 17-member Euro currency, which has been on a downward trend as concerns over European sovereign debt crisis and Greece’s uncertain membership of the Eurozone grows. The Euro fell to as low as $1.24, the weakest since its multi-year low in July 2010 of $1.18 following the first bail-out of Greece. Other major currencies have also seen significant shifts against the Euro which has declined 2.1% this year against nine developed market counterparts. Along with the greenback, the Yen has risen to 6 month highs against the Euro. This has spurred speculation that the Bank of Japan could look at weakening the Yen again. The Yen has stayed relatively constant against the dollar over the last month, suggesting that most currency moves are driven by Euro weakness. Most analysts are predicting further falls in the Euro as the credibility of and confidence in policy makers wanes. Some are even suggesting that the Euro could reach parity with the US dollar by the end of summer. However this downward spiral could quickly reverse if there is more certainty and clarity around Greece’s exit. Further, new proposals to move towards a European-wide deposit guarantee system and common bond issuance could provide more relief. I will be adding analyst updates/interviews shortly and encourage you to subscribe (free) via Email or RSS to get the latest on the US dollar outlook. [2012 Preview] With the prospect of a major Euro-zone recession on the cards, the US dollar is likely to enjoy considerable support in 2012 as investors shift their assets to US backed securities. This is somewhat offset by debt issues that continue to plague the US amid the backdrop of a grid locked Congress and upcoming Presidential election. Moderating growth in China vs improved growth prospects domestically (3% GDP growth in Q4′ 2011) could also provide a temporary boost for the US dollar, as the American equity markets turn bullish. Though, longer term the dollar will continue falling as investors seek higher yields and growth outside the US. [Updated] Is the Dollar losing its safe haven status as Euro regains its Mojo? Currency traders and hedge funds have significantly increased their bets against the US dollar, reflecting a growing belief in the fading luster of the greenback, growing US debt and rising euro-zone inflation and interest rates. Despite geo-political tensions in the Middle East, which normally triggers a flight to safety towards the US dollar and assets, the latest data show that traders are still “shorting” the currency. Figures from the Chicago Mercantile Exchange, which are often used as a proxy for hedge fund activity, showed that short dollar positions surged from 200,564 contracts in the week ending February 22 to 281,088 on March 1. This meant that the value of bets against the dollar on the CME rose $11.5 billion in the week to March 1 to $39 billion, $3 billion more than the previous record of $36 billion in 2007. The data confirm the sharp turnaround in sentiment towards the single euro currency (see previous update below), which was facing major stability issues over the euro zone sovereign debt crisis just a few months ago. Euro-zone rates rising: Jean-Claude Trichet, ECB president, said last week that “strong vigilance” was warranted, a phrase used throughout the bank’s 2005-08 rate-tightening cycle to pave the way for a rate increase at the next governing council meeting. That strengthened the market view in financial markets that the ECB could raise rates at its April meeting and the euro last week rose to a four-month high of $1.3997 against the dollar, taking its gains from a 16-week low of $1.2871 in January to nearly 9 percent. Analysts said the prospect of ECB monetary tightening was outweighing investors’ concerns over the euro zone’s fiscal problems. “Dollar bears have become a marauding horde,” said David Watt, analyst at RBC Capital Markets. Given the continued losses for the dollar this month, he said it was likely that investors had since added to their bets against the U.S. currency, short of an “absolutely stunning” reversal in sentiment. “We may be seeing a turn in the longer-term outlook for the dollar – for the worse,” said Kit Juckes, head of FX strategy at Société Générale. He said the U.S. Federal Reserve was likely to react more dovishly to a supply-side inflationary shock caused by rising oil prices than other central banks. “Clearly some asset managers, presumably the more speculative in orientation, joined hedge funds in putting on long euro exposure, but on a longer view, asset managers remain significantly short and private clients have not even started to turn round their bearish euro positioning,” Mr Siegenthaler said. The other safe haven currency – the Japanese Yen – has also declined versus 14 of its 16 major counterparts in the last month. With investors are searching for currencies that offer both stability and higher yields, the US dollar slide is likely to continue for some time. [Update Q4 2010] Dollar Destruction Continues as Greenback falls to lowest level since 2009 against several major currencies. The dollar’s widespread sell-off continues with the Euro hitting its highest level against the greenback this year and the Japanese Yen reaching a 15-year high. If the dollar drops below ¥79.75, it will be its weakest since the yen was allowed to trade freely in the early 70s. The dollar index (DXY) also reached it’s lowest point of the year, confirming a global anti-dollar stance as investors chase better yields elsewhere. Another sign of US dollar weakness is demonstrated by the number of currencies passing parity (i.e $1 of their currency buys more than $1 USD). The Canadian dollar moved through parity with the U.S. unit for the first time in six months, while the Australian dollar recently hit parity having risen to its highest level since the early 80’s when it was made free-floating. The US dollar’s decline also highlights the contrast between countries recovering from the global slump versus a sputtering American economy. In fact, to addressing tightening credit conditions the US Fed is expected to undertake another round of bond-buying (further devaluing the greenback), as confirmed by Fed Chairman Bernanke’s recent comments. This approach of loosening monetary policy (quantitative easing) is also happening at other central banks facing similar challenges to those in the US, as shown by recent actions of the Bank of England and the Bank of Japan. Hence it is no surprise that they currencies of these nations are also falling versus nations like Australia, where central banks are tightening monetary policy through raising interest rates. [G20 Meeting Updates] Group of 20 pledge to avoid “competitive devaluation” that acerbates the U.S. currency’s decline. However, investors skeptical that this pledge will hold in light of further quantitative easing by the US Federal Reserve to bolster US economy, and US dollar continues to fall after a brief rally. The US dollar fall is actually helping many American business’ as it makes their exports cheaper and boosts locally made product sales as imports become more expensive. In fact the dollar slide is a major source fueling domestic growth in a low inflation environment, something which the government and Fed are actually supporting. Many analysts are predicting that the US dollar will continue it’s downward trend into 2011 and 2012, barring any geopolitical or major economic shocks. There is also a real risk of a currency war emerging if other nations step up to weaken their currencies, which could lead to a marked slow down in the global economy. I’ll provide more updates on this topic and encourage you to subscribe (free) via Email or RSS to get the latest articles on the US dollar outlook. [Updated] Is Euro Pullback For Real or Temporary? The sharp fall in Euro over the last week due to debt crisis in member nations seems overdone with euro on the rise again against the dollar amid speculation traders who bet on its decline amid Europe’s sovereign-debt crisis had to buy back the currency as it strengthened to a one-week high. It had fallen to $1.2144 against the US dollar on May 19, the lowest level since April 2006, before rebounding above $1.26. Longer term though both the US and Euro-zone prefer weaker currencies since it is helpful to rein in budget deficits, particularly for smaller Euro-zone countries. The weaker currency boosts exports and stimulates the economy. However with much more member country intervention it is likely that the Euro will stabilize around $1.30. News from the European and Japanese economies is clouded and uncertain, with growth much slower than in the US. Thus, when investors are uncertain, what happens is they buy dollars. The dollar appreciated 0.9 percent to $1.3410 versus the euro, from $1.3530 a week earlier. It was headed for a gain of 6.8 percent for the quarter, the largest since it advanced 11.8 percent in the three months ended in September 2008. Even the strong resource driven currencies like the Australian and Canadian dollars fell versus the greenback for the first week this month amid speculation gains versus the U.S. dollar and the euro couldn’t be sustained. Australia’s currency dropped 1.2 percent to 90.41 U.S. cents, from 91.54 cents on March 19. The loonie, as Canada’s currency is nicknamed, dropped 0.9 percent to C$1.0266 per U.S. dollar. Mexico’s peso was the only major currency that gained against the dollar this week, as an economic recovery in the U.S. fueled demand for the Latin American nation’s exports. Longer term the US dollar is still projected to weaken due to the overhanging federal deficit. However, with a stronger economy and the prospect of rising inflation/interest rates the US dollar may finish 2010 much stronger against other world currencies. Worrying comments indeed if most of your investments are in the US and linked to the strength of the greenback. Following a loose monetary policy strategy (i.e. a low interest rate environment) foreign central bankers are acting on threats to dump the dollar in favor of the Euro and Yen. This is adding further further pressure on the greenback after its biggest two-quarter rout in almost two decades and signals that the currency won’t rebound anytime soon after losing 10.3 percent on a trade-weighted basis the past six months, the biggest drop since 1991. Foreign Policy makers boosted foreign currency holdings by $413 billion last quarter, the most since at least 2003, to $7.3 trillion, according to data compiled by Bloomberg. Nations reporting currency breakdowns put 63 percent of the new cash into euros and yen in April, May and June, the latest Barclays Capital data show. That’s the highest percentage in any quarter with more than an $80 billion increase. The dollar’s 37 percent share of new reserves fell from about a 63 percent average since 1999. America’s currency has been under siege as the Treasury sells a record amount of debt to finance a budget deficit that totaled $1.4 trillion in fiscal 2009 ended Sept. 30. Intercontinental Exchange Inc.’s Dollar Index, which tracks the currency’s performance against the euro, yen, pound, Canadian dollar, Swiss franc and Swedish krona, fell to 75.77 last week, the lowest level since August 2008 and down from the high this year of 89.624 on March 4. The index, at 76.104 today, is within six points of its record low reached in March 2008. Sentiment toward the dollar reminds John Taylor, chairman of New York-based FX Concepts Inc., the world’s largest currency hedge fund, of the mid-1990s. That’s when the greenback tumbled to a post-World War II low of 79.75 against the yen on April 19, 1995, on concern that the Fed wasn’t raising rates fast enough to contain inflation. Like now, speculation about central bank diversification and the demise of the dollar’s primacy rose. The currency then gained 26 percent versus the yen and 25 percent against the deutsche mark in the following two years as technology innovation increased U.S. productivity and attracted foreign capital. Dollar Forecasts : The median estimate of more than 40 economists and strategists is for the dollar to end the year little changed at $1.47 per euro, and appreciate to 92 yen, from 89.97 today. >The growth of global reserves is accelerating, with Taiwan’s and South Korea’s, the fifth- and sixth-largest in the world, rising 2.1 percent to $332.2 billion and 3.6 percent to $254.3 billion in September, the fastest since May. The four biggest pools of reserves are held by China, Japan, Russia and India. China, which controlled $2.1 trillion in foreign reserves as of June 30 and owns $800 billion of U.S. debt, is among the countries that don’t report allocations. “Unless you think China does things significantly differently from others,” the anti-dollar trend is unmistakable, Englander said. [Updated Sep 2009] US Dollar on the Ropes? It looks like the bears are out in force again when it comes to the US dollar with many saying that a global economic recovery, huge deficits and loss of status as the world’s reserve currency spell doom and gloom for the once mighty greenback. This is reflected in the Dollar Index (DXY) which was below 80c. It has fallen 12 percent from this year’s high in March as U.S. authorities pledged $12.8 trillion to combat the recession. A recent bloomberg piece looked at what some of the leading money managers are saying about the prospects of the US dollar in the years ahead and unfortunately it was hard to find much good news to support dollar strength in the medium to longer term. PIMCO, the world’s biggest manager of bond funds, said the dollar will weaken as the U.S. pumps “massive” amounts of money into the economy [in response to the financial and housing crisis]. The dollar will drop the most against emerging-market counterparts, Curtis A. Mewbourne, a Pimco portfolio manager, wrote in a report on the company’s Web site. The greenback is losing its status as the world’s reserve currency, he said. “Investors should consider whether it makes sense to take advantage of any periods of U.S. dollar strength to diversify their currency exposure.” Bill Gross, who runs the $169 billion Pimco Total Return Fund, is also warning the U.S. currency will fall. The U.S. government boosted spending and the Federal Reserve bought bonds to revive credit markets that seized up after financial companies posted $1.6 trillion in writedowns and losses, raising concern there is an oversupply of greenbacks. The U.S. budget deficit reached a record $1.27 trillion for the first 10 months of the fiscal year and broke a monthly high for July. Famed investor Jim Rogers, who said last year that he was shifting all his assets out of dollars and buying Chinese yuan because the Fed eroded the value of the U.S. currency. This feeling is backed by a number of money mangers who are advising clients to diversify out of the US dollars before central banks and sovereign wealth funds do the same because of concern government budget deficits will deepen, Gross said in June. Billionaire Warren Buffett wrote in a New York Times commentary today that the dollar is under threat from the “monetary medicine” that has been pumped into the financial system. Enormous dosages of monetary medicine continue to be administered and, before long, we will need to deal with their side effects,” Buffett, 78, wrote. The “greenback emissions” will swell the deficit to 13 percent of gross domestic product this fiscal year, while net debt will increase to 56 percent of GDP, he said. U.S., with Premier Wen Jiabao this month publicly expressing “worries” over China’s significant holdings of U.S. government bonds. President Obama was forced to publicly assure the Chinese that all is well. Because other nations continued to park their money in U.S. dollars, the argument goes, the Federal Reserve was able to pursue an irresponsible policy in recent years, keeping interest rates too low for too long and thereby helping to inflate a bubble in the housing market. The appreciation of the dollar over the last few months was primarily due to a perceived flight to safety in US treasuries, which foreign investors and governments bought as other asset classes became more risky. However with all the trillions in stimulus spending, bank bailouts and other fiscal policy measures many are now questioning the impacts on the future value of the US dollar. In an ironic twist, should the local and global economy start to show signs of real improvement, the US dollar will most likely plummet as the “safety” trade unwinds. Case in point, as the stock market jumped 20% over the last 2 weeks on possible signs of a recovery, the dollar index (DXY), a measure of the greenback strength against a trade-weighted basket of six major currencies, dropped by over 10%. There is not much do in the short term – the US dollar/debt is the only game in town for now, with few alternatives other than gold. But longer term and if you are mainly an equity investor you need to factor in that the fall of the US dollar is more likely than not. Unfortunately, the lower US dollar will also drive inflation domestically and reduce our consumer and corporate purchasing power. No one knows currency movements for sure, but your best bet is to ensure you have significant international diversification in your retirement and trading portfolio’s. [Previous update] For most people the direction of the US dollar should matter. Whether the impact is direct (value of foreign holdings) or indirect (oil prices) it is important to understand where the US dollar is headed because of its effect on you. For me in particular it is important as I work/live in the US, travel overseas and have a significant part of my investment portfolio abroad. Unfortunately over the last few years the dollar has been on a downward trend with little upward respite. The Dollar Index traded on ICE futures in New York, which tracks the dollar against currencies of our six largest trading partners has fallen over 15% in the past year. So is this down trend going to continue or will the dollar finally stand up and regain some of its lost value? Before looking at the outlook for the US dollar, it is important to understand the key forces that drive currency movements. Budget Deficit and Large import/export imbalance – The US runs a large budget deficit meaning that the value of our imports far exceeds that of our exports. To fund this deficit we need to continually sell US dollars to buy foreign currencies or repay debt. The increase in supply of US dollars to achieve this leads to a devaluation the currency. So as the deficit grows the dollar continues to weaken. A country like China on the other hand, exports significantly more than it imports. As a result, China will build up massive amounts of US dollars and US debt in its reserves (budget surplus) and will eventually sell dollars and buy other things (Euros, oil, gold) in order to diversify and get higher returns. As they sell their dollar holdings the US currency declines. Another factor driving the deficit is the tremendous cost to fund the wars in Iraq, Afghanistan and other places. As the country spends billions of dollars to maintain an overseas presence, we keep adding to our national debt and budget deficit. Interest Rates and Economy– The fed has been aggressively lowering interest rates (and increasing the money supply) to keep the economy afloat after the sub prime and credit crisis. However the consequence of low interest rates and a faltering economy is that the US becomes much less attractive to foreign investors who can get larger risk free returns by putting money in higher interest rate counties like Australia and New Zealand (official interest rates there are around 7.5% compared to 3% here in the US). Lack of foreign investment in the US reduces demand for the dollar and results in the currency depreciating. This factor is probably the most influential in currency movements. Speculation – This is when speculators bet that the economy, interest rate or other factors are going to continue to drive the US economy and currency down. This added pressure sets negative expectations and acts as an added (albeit unreal) force to keep the dollar down. There are both benefits and drawbacks to a low US dollar. Our exporters become more competitive on a global level, companies overseas earnings are higher in US dollar terms and it helps the tourism industry. However we are currently being impacted much more by the negative effects of the lower dollar which has resulted in higher oil and commodity prices; and the continued erosion of the relative wealth of US residents in global terms. Worst of all it drives inflation as the cost of imported goods becomes more expensive. t the world due to dollar weakness, and the prices of such commodities as oil and corn have soared. The dollar has fallen 25% since 2002, and nearly 8% against the euro so far this year. 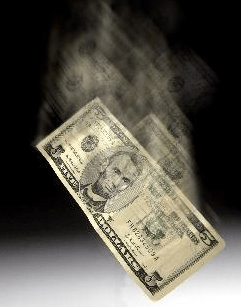 As former Federal Reserve Chairman Paul Volcker noted last week, we are already in a “dollar crisis.” Even the International Monetary Fund – typically the temple of devaluationists – is alarmed by the dollar’s fall. “As the dollar’s fortunes have become increasingly tied to inflation concerns…a firm break to the downside in oil prices will be needed to help the dollar find the momentum to strengthen,” said Manuel Oliveri, a currency strategist at UBS. From my research and reading the outlook for the dollar looks quite bleak over the next year due to various economic pressures. However as the economy starts recovering and the federal reserve starts tightening monetary policy (raising interest rates) the US dollar will start appreciating. This should start happening towards the end of this year and my view is that by the end of 2009 the dollar should be up 15-25% from current levels. As the US dollar, or greenback as it is called, recovers along with the economy we should see lower inflation and higher house prices. Best of all, oil and gas prices should start to fall as well. With its military and technological might USA controls the world. Accumulating wealth is for the weak. For the almighty, just stretch the hand and take what you need. Do not wish for the downfall of USD. Travel to Europe in October. How is the CAD $$ doing against the Euro? Is this a good time to buy Euros with CAD$$ or should I wait? So all this talk about oil and gold…. “What exactly are they planning to do about militray families stationed overseas?” When will they discuss that? Our dollar is so weak and costs a fortune to convert. Are they going to raise the pay? Will they try to get other countries to accept the dollar. Many places will not take it because it is so weak and they lose money. We are in Italy and for example you actually have to pay to report your childs birth (which is a joke to me) but like 80 euro right now is about 110 american dollars. You can see the problem here. Based on your article, clearly the US dollar is volatile. I think the downside may be limited as much of the impact from additional Fed easing has been priced in and bearish sentiment on the dollar has reached extreme levels. But American, but USD! I think the dollar will go down as the recessionary worries go away because many fled to the dollar because it is safe. Plus, the US has increased its debt and is continuing to pump money into the economy. I see more and more issues about our dollar losing value and many remedies and predicaments have been addressed. I like to suggest that “why not in cooperation dollar with in the North America like Euro” it can benefit not only U.S. self, but as will as Canada and Mexico since they have NAFTA and CAFTA trade emplaced already. Well, your theory sounds very much like the Globalists desire to create a North American Union and combine all money into something like the Amerios. Certainly not something I would want to see. We are all ready in trouble and who would want to take on Mexico’s issues/debt on top of our own? Canada isn’t going to want to bail out the US and Mexico. It would not work. No body can afford to bail out the US except the US. Currently the US’ debt is at 93% of GDP where Canada’s debt is somewhere north of 200% of its GDP. So Canada isn’t as solvent as it think it is. The US is dead set against any “North American Union” currency because of the sovereignty concerns that it has. This economy is a concern the American people have and will fix in Nov 2012. I don’t know where you got those debt-to-GDP ratios, but en.wikipedia.org/wiki/List_of_countries_by_public_debt says Canada’s is around 84% and the USA’s is around 95-100%. appeared on the market.that was the only reason of crisis.nothing happened to the companies around the world and after a short period of time everything is ok.stocks will cost as they did in 2007 soon.dollar is strong not because of fed reserve of the united states but because a lot of companies all over the world are american and profitable.that means that in next 50 years nothing bad will happen to dollar.allmost all of chinese companies are owned by americans and their profit is gained by shareholders. Andrew- I see that it has been several months since your post however I just came across it. Hopefully since then you have seen that your ideology on the subject matter is clearly off balance. The realization is, that the US dollar is failing. Forget the US Gov’t. It is the Globalist who want to see the destruction of America and the rise of new foreign powers. The people living in this county need to open their eyes and close their ears to the media. They need to research and read and understand that history repeats itself and that cycles do exist. When the cycle takes a left turn, it is no longer considered cyclical. The US is going to get the shaft very very soon! 1- The US is bailing themselves out because China and other countries are sick of doing it. 2- Problems in the Middle East are nothing more than stage puppets pulling peoples attention away from Russia, China and other countries who are preparing to do bussiness (oil) and contracting without using the DOLLAR! The dollar is the global currency yet, they did not use it. Why? Because it is jeoprady. 3- We have not been on the gold standard since the 70’s but yet, Gold and other prescious medals seems to be doing well while the dollar is shrinking. Going back to number 1, I will also state that the US Gov’t continues to pump green into the economy with no way to cover it. Therefore, 1+1=2 and Hyper inflation + low dollar value = No gas and no food and a country looking like Zimbabwe. This county is going down at the bow! If there is anyone who can show me that I am wrong and provide me with actual proof and not just the banter of “I love America,” I encourage you to please step forward. I would LOVE to be wrong! you are certainly right but the situation will never be like that of Zimbabwe!! that will be tge end of the world economy.